The Soul Cook Books also backed Sammy Roberson on Al Mitchell’s label, and I’m pleased to say that both 45s are amongst the best deep soul ballads ever recorded - and therefore indispensable. 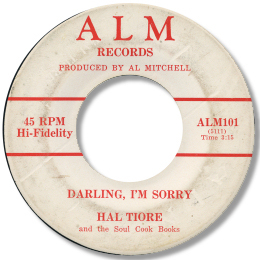 Over the classic combination of chorded organ and “open” guitar figures Hal sings about his regrets and apologises for his behaviour in a gruff, flexible baritone. The production is pretty low budget and the horns are way down in the mix, but this only emphasises the passion in Tiore’s vocal. Great stuff. This must have been cut in the mid-60s but where? Also I only know the 2 ALM releases – are there any more?